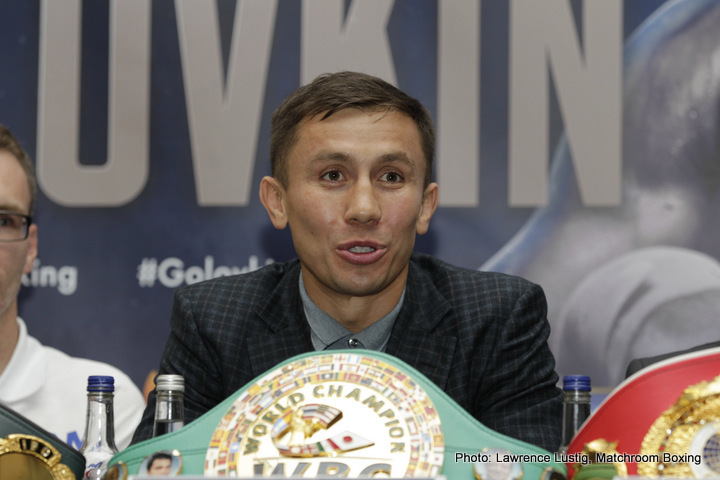 According to Tom Loeffler, promoter of world middleweight king Genandy Golovkin, Billy Joe Saunders will get his wish this year: that of being able to climb into a ring with GGG in a four-belt unification showdown. Should Triple-G defeat Canelo in their eagerly awaited rematch set for May 5 (still no venue officially named), he will then fight the British southpaw who holds the WBO belt. Loeffler told Eduard Cauich how no third fight between GGG and Canelo was not discussed and that Golovkin will look to hold all four belts this year; by taking on the unbeaten Saunders before this year is out. So, providing GGG gets the win on May 5, Saunders will get what he has been asking and calling for, demanding even, for the longest time. It is by no means certain who wins the GGG-Canelo II fight, or if we will even get a winner (what price a second draw between them?) and if the rematch winds up being another close or debatable fight, with a debatable result, fans will likely call for the rubber-match. But how big would a third fight be if GGG entered it holding all four middleweight belts? But can GGG, now 36 and possibly slowing down, beat a Billy Joe Saunders who is on fire the way he was against David Lemieux last December? Saunders doesn’t think so, neither does his promoter Frank Warren. If it indeed happens this year, GGG-Saunders will be one of the biggest fights for a British fighter in some years. And if BJS can pull off a win…….! Saunders says he has what it takes. Maybe he and we will find out if he’s right. And maybe GGG will even agree to take the fight in the UK. Previous boxing news: Selby v Warrington General Sale Tickets Available Now! Next boxing news: Who is taking the riskier fight: Wilder (Vs. Ortiz) or Johsua (Vs. Parker)?